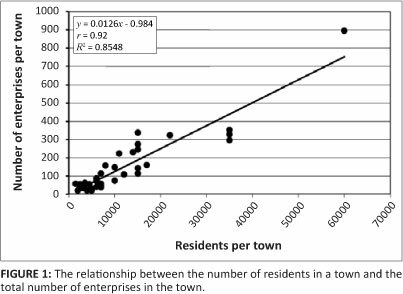 We investigated proportionalities in the enterprise structures of 125 South African towns through examining four hypotheses, (1) the magnitude of enterprise development in a town is a function of the population size of the town; (2) the size of an enterprise assemblage of a town is a function of the town's age; (3) there are statistically significant relationships, and hence proportionalities, between the total number of enterprises in towns and some, if not all, of the enterprise numbers of different business sectors in towns; and (4) the implications of proportionalities have far-reaching implications for rural development and job creation. All hypotheses were accepted on the basis of statistically significant (p < 0.05) correlations, except for the second hypothesis - the age of a town does not determine the size of its enterprise assemblage. Analysis for the fourth hypothesis suggested that there are two broad entrepreneurial types in South African towns: 'run-of-the-mill' entrepreneurs and 'special' entrepreneurs, which give rise to different enterprise development dynamics. 'Run-of-the-mill' enterprises are dependent on, and limited by, local demand and if there is only a small demand, the entrepreneurial space is small. By comparison, 'special' enterprises have much larger markets because their products and/or services are exportable. We propose that the fostering of 'special' entrepreneurs is an imperative for local economic development in South African towns. The primary concept considered here - proportionality in enterprise development - was an aspect of the studies of South African towns during the 1960s and 1970s,1,2 but was later neglected. We have revisited it here because of new ideas about economic and regional development that have developed over the past three decades, which also touch upon current South African economic development challenges and realities. It should not, in other words, be hard to convince economists that economic geography - the study of where economic activity takes place and why - is both an interesting and important subject. Yet until a few years ago it was a subject mainstream economics largely neglected. Fujita et al.5 pursued two concepts, (1) in a world where increasing returns and transport costs are both important, forward and backward linkages can create a circular logic of agglomeration - producers want to be located close to their suppliers and customers; and (2) the immobility of some resources, for example, land, and in some cases labour, acts as a centrifugal force that opposes the centripetal force of agglomeration. The tension between centrifugal and centripetal forces shapes the evolution of an economy's spatial structure. Fujita et al.5 suggested that their approach should be buttressed amongst others by empirical work; a suggestion acted upon in this investigation. Florida examined the rise of the 'creative class' in the USA.6 He sketched the importance of three 'Ts' - technology, talent and tolerance - for urban and enterprise development. Creative people, the drivers of the 'knowledge economy', do not necessarily settle where jobs are but strive to settle in places that are open and tolerant, and where many different types of people feel at home. Knowledge era enterprises now have to follow the creative talents they need and not vice versa. Economic wealth and biological wealth are thermodynamically the same sort of phenomena, and not just metaphorically. Both are systems of locally low entropy, patterns of order that evolved over time under the constraint of fitness functions. Both are forms of fit order. Each individual enterprise, like each living organism, is therefore in constant competition for survival and only the fittest survive. Therefore, at any point in time, the size and composition of enterprise assemblages in an economy present a time-integrated picture of the forces that drove that economy over previous periods. Toerien and Seaman8 extended the ideas of Beinhocker7 by examining the hypothesis that if enterprises are analogous to living organisms in the sense that they are both forms of fit order, towns must be analogous to natural ecosystems, that is, they are enterprise ecosystems. They accepted this hypothesis on the basis of a study that applied methods widely used in ecological studies to the enterprise assemblages of towns in the Great Karoo in South Africa. Toerien and Seaman9 also successfully applied the Species Equilibrium Model of island biogeography10 in an examination of the enterprise dynamics of 12 Karoo towns in the Eastern Cape. The ecological model predicts that the rate of new immigrant species arriving, the rate of species extinction and the rate of speciation on an island will reach an equilibrium, where the number of species on the island will be a function of the size of the island and its isolation from a mainland (the source of new species). Toerien and Seaman9 found that enterprises in the selected Karoo towns behaved like species on natural islands, exhibiting statistically significant correlations (in other words proportionalities) between enterprise numbers and the size of the town. They concluded that the towns are 'enterprise islands', in addition to being enterprise ecosystems. The primary purpose of this contribution was to examine proportionalities in enterprise development in a large number of South African towns. The implications of such proportionalities for local economic development (LED) planning were secondarily considered. The South African government has for more than a decade struggled with the recalcitrant issues of rural poverty and unemployment,11 particularly with regard to previously disadvantaged individuals. Developing a deeper understanding of the enterprise dynamics of South African towns, particularly about enterprise proportionalities, is an imperative in LED planning. Van der Merwe and Nel1 explained that the threshold population, that is, the minimum population size necessary to support a specific type of enterprise in an urban settlement, is important in economic geography. Based on the South African population size in 1970 and trade statistics for 1966/1967, they provided threshold numbers for many different types of enterprises (e.g. grocers, general dealers, butcheries and pharmacies). They argued that thresholds are determined by free competition between enterprises and that maximisation of profits drives a process in which the number of a specific type of enterprise in a region balances the need for such enterprises in the region. The above implies that there must be proportionalities amongst different enterprise types. For example Van der Merwe and Nel1 provided the following thresholds for a town: grocers = 1719, general dealers = 2129, butchers = 5770 and pharmacies = 12 661. It follows that for every pharmacy in a town there should have been approximately seven grocers, six general dealers and two butchers. They did not, however, explicitly study this kind of proportionality. If such proportionality still exists, useful norms could be developed against which the enterprise evolution of specific towns can be assessed. Christaller's central place theory has long dominated thinking about towns and their functions in South Africa.1 For instance, Davies and Cook2 employed 55 central functions to classify 601 South African urban settlements into eight levels of hierarchy. Nel and Hill12 presented a hierarchy of Karoo towns with specific hierarchy levels defined as the functions of lower levels plus some additional ones. For instance, the level 5 functions of Karoo towns were defined as levels 6, 7 and 8 functions plus additional functions providing services with regard to roads, libraries, schools, public administration, financial management, wholesales and cinemas.12 Implicit in the definition of these hierarchies is an acceptance of the fact that towns at higher ranks in the hierarchy would have more types of service providers than towns of lower ranks and, thus, proportionally more of the total number of services provided in all towns. The latter kind of proportionality has been neither formally quantified nor used as a concept to understand the enterprise dynamics of South African towns. The philosophy embodied in complexity economics theory provides an opportunity for new economic models to help us to expect and understand proportionalities in the enterprise development of towns.7 According to Beinhocker7, economic activity is fundamentally about order creation, and evolution is the mechanism by which order is created. Businesses (enterprises) are 'interactors' that struggle in a 'survival-of-the-fittest' competition in economic evolution. Enterprises produce and/or deliver and sell either products or services. The enterprises that best (but not necessarily the most cheaply) meet the needs of their clients are bound to win the struggle for survival. The composition of an enterprise structure of a town (enterprise ecosystem) should, therefore, reflect the balance in the spectrum of the needs of clients of the town's enterprises. Beinhocker7 pointed out that the economy, and therefore all enterprises, are subject to the Second Law of Thermodynamics (the law of entropy). Products and services having a higher level of order than their constituent parts can only be produced or delivered by an increase in disorder (i.e. higher entropy, e.g. pollution) elsewhere. Energy inputs are needed to counter the ravages of entropy but energy costs money. Accordingly, the flow of money from clients who purchase the products and/or services must, (1) recompense businesses for their expenses, including the cost of energy and materials, wages, and costs in dealing with waste and pollution; (2) provide their profits; and (3) enable them to excel (or fail) in the 'survival-of-the-fittest' competition. The total amount of money from whatever source (farming, wages, welfare payments, pensions and profits) that is available to be spent on products and services in a specific town, determines the number of the town's enterprises.8 The composition of the needs of the buyers of products and services (clients) of the town's enterprises determines the composition of its enterprise structure. Once the number of clients for the products or services delivered by a particular kind of enterprise exceeds the threshold numbers for such enterprises, 'entrepreneurial space' opens up. Conversely, if the number of clients falls below particular threshold numbers, entrepreneurial space retracts. Services to rural agricultural hinterlands have long been recognised as a primary reason for the development of towns in South Africa. For instance, Fransen13 referred to towns that developed around churches established in new parishes as 'church towns'. In contrast to the South African government's focus on farming concerns during the 20th century, the post-apartheid government adopted a policy with a strong urban focus that reflects the reality that the majority of the South African population is now urbanised.12 The implications of the above are that rural hinterlands have become less important to towns and their enterprises are more dependent on clients who are town residents. The enterprise numbers of a town should, therefore, at least in part reflect (in numbers and composition) the total needs of the clients of these towns. 1. The magnitude of enterprise development in South African towns should be a function of the population sizes of these towns. The null hypothesis is that there is no statistically significant relationship between the population size of a town and the size of its enterprise assemblages. 2. Because factors other than agriculture (e.g. mining) have contributed to the development of specific towns, the size of enterprise assemblages of towns is not a function of town age. The null hypothesis is that, in general, there is no statistically significant correlation between the number of enterprises in a town and the age of a town. 3. People have proportional needs for different products and/or services (e.g. for food, liquor, furniture and clothes).1 Therefore, if the first hypothesis is correct, there should also be proportionalities (measured as statistically significant correlations) between the number of enterprises of different business sectors and the total number of enterprises in a town. The null hypothesis is an absence of such statistically significant correlations. 4. Proportionalities, if they exist, could have far-reaching implications for rural development and job creation. The null hypothesis is that there are few, if any, useful sector proportionalities to assist in LED planning and execution. An enterprise structure database of 125 South African villages and towns was used (Table 1). There was no specific logic to the selection of the towns other than that they represented all the towns for which enterprise structures had been determined at the time of writing this contribution. The selection included towns of different origins (e.g. mining, tourism, agricultural, former Homelands, river and arid area towns) from seven South African provinces. Pearson correlations were performed to determine proportionalities. Microsoft Excel software was used to perform the analyses and a statistically significant correlation (p < 0.05) resulted in rejection of the null hypothesis. The first hypothesis was tested by calculating the Pearson correlation coefficient between the populations of towns (independent variables) and the enterprise numbers per town (dependent variables) for a subgroup of South African towns. A subgroup of towns was used because formal population numbers for towns are not readily available. The exercise was complicated by a number of issues, (1) the resident numbers for South African towns are not readily available from the most recent formal census data because the latter was focused on local authorities that often include more than one town; (2) little separation is made between urban and rural (hinterland) data; and (3) the last census was done in 2001, nearly a decade ago. Consequently, estimates of town populations for 2006 reported by Hans Fransen, a well-known town planner, in his book on old Cape towns14 were used for towns that were included both in Fransen's book and in the database on which this contribution is based (n = 35). Enterprise number in town = 0.0106 (urban population number) - 21.8. To test the second hypothesis, a Pearson correlation coefficient was calculated between the age of the selected towns and enterprise numbers. The founding dates of towns were found in either Fransen14, Erasmus15, or, if these did not provide the information, Internet searches. The only town for which a founding date could not be established was Klipplaat, which was excluded from the analysis. 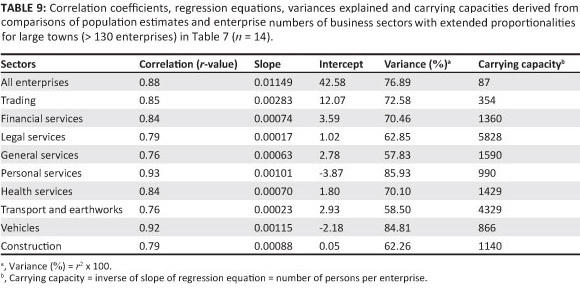 To examine the third hypothesis, Pearson correlation coefficients and regression equations were calculated between the total number of enterprises per town (independent variable) and the number of sector enterprises per town (dependent variables) for each of the 19 different business sectors selected (Table 2). Because the magnitude of the enterprise assemblages of towns varied from 8 for a small village such as Norvalspont, to more than 1800 for a town such as Welkom, care had to be exercised to prevent the use of spurious correlations (and spurious interpretations) resulting from the size differentials of enterprise structures of towns. Knowing that smaller towns have fewer service functions1 it was also necessary to ask if observed proportionalities extended over the whole range of enterprise assemblages in the selected town group. To examine these questions the selected group of towns was divided into three approximately equally sized subgroups: 40 large (> 130 enterprises per town), 38 medium (between 50 and 130 enterprises per town) and 47 small (fewer than 50 enterprises per town) towns. Just as for the total group of towns, Pearson correlation coefficients and regression equations were calculated and tested for each of the subgroups. Significant correlations (p < 0.05) were registered between the total number of enterprises per town (independent variable) and the number of sector enterprises of all 19 different business sectors (dependent variables) for the total town group (Tables 3, 4 and 5). Some of the regression equations explained almost all of the variance in sector enterprise numbers and others only a limited amount. Strong proportionalities were observed within the business sectors of large towns whilst fewer proportionalities were observed in smaller towns. 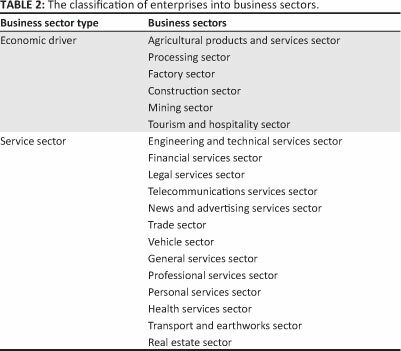 Three broad groups of business sectors were identified (Table 6), (1) sectors such as agricultural products and services, and the processing and the factory sector, where only about 25% - 30% of the variance was explained by the regression equations, (2) sectors such as mining, tourism and hospitality, news and advertising, and real estate services, where 50% - 60% of the variance was explained by the regression equations and (3) sectors such as construction, engineering and technical services, financial services, telecommunications services, trade, vehicle, general, professional, personal, health services, and transport and earthworks, where in excess of 75% (and sometimes more than 90%) of the variance was explained by the regression equations. Proportionality occurs in different business sectors of South African towns and comes in more than one guise. Toerien and Seaman8 identified six business sectors as the economic drivers of South African towns (Table 2). With the exception of the construction sector, these sectors all had regression equations that explain a fairly limited part of the variance of sector enterprise numbers (Table 6). This phenomenon required further consideration because of its potential impact on LED planning. Tourism has been promoted as an economic activity that can contribute significantly to rural economic development in South Africa.17 The number of tourism and hospitality sector enterprises in towns was significantly correlated with the total number of enterprises per town, but only 58% of the variance in the enterprise numbers of this sector was explained by the regression equation (Table 6). Larger towns are nevertheless likely to have reasonably strong tourism and hospitality sectors. In the medium and small town groups much less of the variance in the sector was explained by the regression equations (Table 6). Some towns in these groups have strong tourism and hospitality sectors but others have very weak tourism and hospitality sectors. Successful positioning of towns in the tourism and hospitality sector is neither an automatic nor an easy process. Value addition has been promoted as a means of adding economic value in South African towns.18 Two business sectors that add value to either local and/or external primary and/or intermediary materials are the processing and factory sectors.8 Success in these sectors had little association with the size of the enterprise assemblages of South African towns (Tables 3 and 6) and smaller towns often had more processors and/or factories than did larger towns. Success in these sectors depends on aspects such as 'special' entrepreneurship, talented individuals and management according to the key success factors of a specific business model.19 In this study, relatively small towns were quite successful in the processing sector, suggesting that it is not beyond the capabilities of small towns to achieve success. The mining sector needs special consideration. 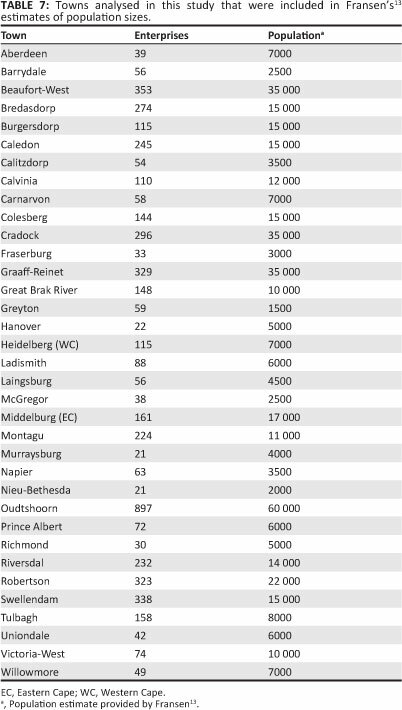 The statistically significant correlations (and hence proportionalities) registered between the numbers of mining-related enterprises and the total number of enterprises for the total town group, as well as for the large town groups (Table 3), could be spurious and might have been caused by the impact on the calculations of the large mining sector of Welkom. However, a large mining sector is not a precondition for significant business development, because some other large towns in this study did not have significant mining sectors. The mining sector also did not have a major impact on the enterprise assemblages of medium and small towns and there were no proportionalities (Table 3). The only economic driver sector that showed significant proportionality throughout is the construction industry (Table 3). This proportionality only really applied to large towns, because although there was a positive correlation between the number of construction enterprises and the total number of enterprises in the medium and small towns, the degree to which the variance could be explained was low and towns of equal size can differ widely in the number of their construction enterprises. The fact that large towns have proportionally larger construction sectors and small towns sometimes have few, if any, suggests that some, if not all, construction activities in smaller towns might be provided by suppliers from the informal sector. Proportionalities in the service sectors (Table 2) were much higher than in the economic driver sectors (with the exception of the construction sector) (Tables 4 and 5) and more of the variance was explained by the regression equations (Table 6). The outstanding example of service sector proportionality that extends right through all of the size ranges of towns is the trade sector (Table 6). Amongst the medium and small towns there were larger variances than what was encountered for the large town group. Nevertheless, proportionality remained strong over all of the groups (Tables 4 and 5). Other service sectors with reasonably strong extended proportionalities were the financial services, legal services, general services, personal services, health services, and the transport and earthworks sectors (Tables 4 and 5). The engineering and technical services, telecommunication services, news and advertising services, vehicle, professional services, and real estate services sectors showed strong proportionalities as far as the large towns were concerned (Tables 4 and 5). These proportionalities apparently broke down for smaller towns. Just as in the construction industry, shifts across the interface between the formal and informal economies might be the cause. In summary, whilst the economic driver sectors, with the exception of the construction industry, exhibited limited proportionalities (Table 3), the service sectors had more pronounced proportionalities, especially for large towns (Tables 4 and 5). Van der Merwe and Nel20 provided estimates of threshold numbers for a variety of different types of service suppliers. Using total population and total enterprise numbers to calculate threshold values assumes a linear relationship between the population and the number of enterprises. This study confirmed the existence of a linear relationship (Figure 1). A further question arose as to whether linear relationships also applied to sector enterprises. 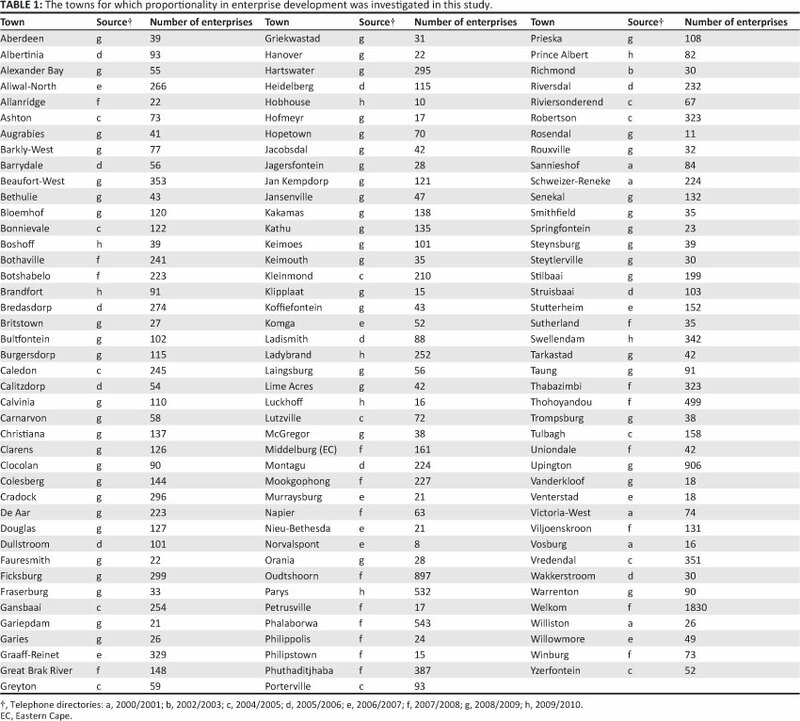 Some of the towns in this study were towns for which Fransen13 provided population estimates (Table 7), which allowed investigation of the relationship for sector enterprises. Regression equations were calculated for town population numbers (independent variable) and sector enterprise numbers for those business sectors with extended proportionalities (Table 8). Because some of these business sectors did not have strong proportionalities in the medium and small town groups, distortions of the regression equations could have resulted. To check if this had happened the above calculations were repeated (Table 9) for those large towns (more than 130 enterprises) included in Table 7. Comparison of Tables 8 and 9 indicates that, if distortion was introduced, it was not severe. The precision of the above regression equations is confounded by the reality that population estimates of town populations rather than hard census data had to be used. The 2011 South African census should provide better estimates of town populations for future analyses. Enterprise proportionality is worthwhile investigating for a number of reasons. 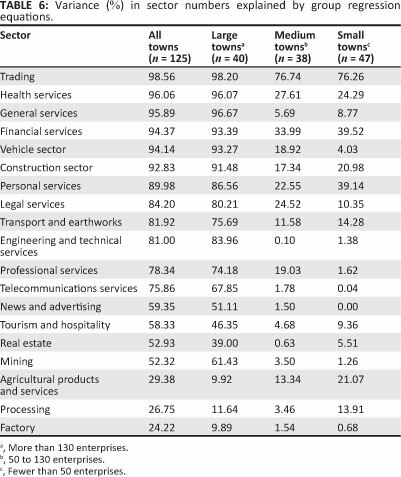 This study augmented the original observations about threshold populations1 by revealing that there are currently still strong proportionalities between the total number of enterprises per town and the number of sector enterprises per town for most of the services sectors presented in Table 2. 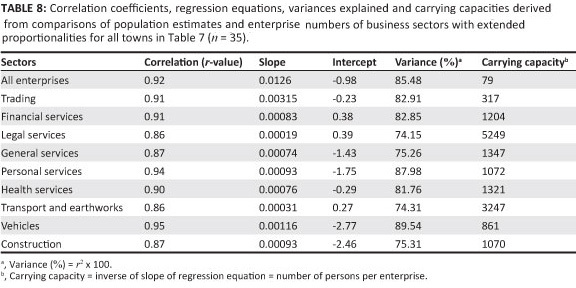 Regression equations quantified these relationships (Tables 3, 4 and 5) and much of the variances of particular sector enterprise numbers were explained (Table 6). Proportionalities were also linked to the population numbers of towns in general (Table 8) and especially to those of the large towns (Table 9). The question as to why there are such marked differences in proportionalities between most of the economic driver sectors and the service sectors deserves attention. In particular, the difference(s) between the utilisation of entrepreneurial space in the trade sector (Table 4) in contrast to, for example, the processing sector (Table 3), needs clarification. A specific question can be posed: why is there such a strong correlation in the trade sector over 125 towns of different sizes, ages, physical localities and origins, and why is it not the case for the processing sector? Considering Beinhocker's22 discussion of competition between business plans, and hence between enterprises, different proportionalities in the two sectors probably suggest that entrepreneurial space is used differently by the entrepreneurs of the two sectors. In the trade sector, entrepreneurs are able to 'see' business opportunities easily and exploit them. As a consequence, when one business disappears as a result of competition it is rapidly replaced, usually by the actions of a different entrepreneur who is willing to take on the risks involved. This phenomenon represents 'run-of-the-mill' entrepreneurship with entrepreneurs that can 'see' and react to 'standard' business opportunities with perceived limited risks. In contrast to the above, value addition in the processing and factory sectors is not pursued effectively in South Africa and small towns may have more of these enterprises than very large towns (Table 3). Obviously, available entrepreneurial space is not being utilised fully, perhaps because it is much more difficult to 'see' these business opportunities and they probably are more risky and require significantly higher capital inputs. Success in these sectors is dependent on 'special' entrepreneurs. The basic differences between enterprises founded upon 'run-of-the-mill' and 'special' entrepreneurship are fundamental. 'Run-of-the-mill' enterprises are dependent on, and limited by, local demand and if there is only a small demand, the entrepreneurial space is small. In contrast, 'special' enterprises have much larger markets because their products and/or services are exportable, or in other words, they are potential global players and have an unlimited scope. The implications for rural development and regeneration of these two broad entrepreneurial types are considerable. For instance, the results (Table 4) suggest very strongly that the trade sector offers little scope to expand local economies because the entrepreneurial space in the trade sector is already fully exploited and there is little chance to create additional opportunities for emergent entrepreneurs. When a new enterprise is started in a sector that is already congested and in balance with the market demand of this sector, it will be subject to strong competition. If it manages to scrape out a place in the sector, it will do so at the expense of another enterprise that already operates in that sector. A system of 'musical chairs' will ensue where one enterprise is merely replaced by another but the total 'game' has not grown. To expand the economies of South African towns, the money spent in the economies of these towns must be grown. This challenge is huge. Nel and Hill12 outlined some of the complicating factors, for example, agriculture being under pressure resulting in a loss of farmers and farm workers as clients of towns' enterprises; better roads and transport infrastructure resulting in rural and town residents making their purchases in the larger towns of a region; the loss of personnel (and their wages) of government departments and organisations such as the South African Railways, and the loss of schools. Sharp contrasts exist in LED practice between large cities with their focus on competitiveness, secondary cities with a focus on economic readjustment and small towns in which LED practice is limited or laggard.17 Given these challenges, it is clear that development strategies must focus on how the flow of money into towns can be enhanced. Success in the mining sector depends on the presence of mineral resources, which cannot be planned. Therefore, growing the processing, factory, tourism and hospitality, and construction sectors must be a serious consideration in most strategic LED plans for towns because these sectors offer opportunities to increase the flow of money into towns. Several studies have indicated that many municipalities lack an understanding of their economic spaces.17,21 The hypothesis outlined here, of two broad kinds of entrepreneurship in South African towns, offers a new way of thinking about rural development and job creation. It needs to be investigated further and a better understanding of the proportionality phenomena is a key to such an endeavour. We gratefully acknowledge the financial support of the Centre for Environmental Management, University of the Free State; the library support of Annamarie du Preez and Estie Pretorius; and the analytical support of Marie Toerien. D.F.T. was responsible for the conceptualisation of the basic ideas, the analyses of the enterprise assemblages of towns, the interpretation of the results and writing the manuscript. M.T.S. refined some concepts and provided advice from an ecological perspective.